If anyone comes to you and does not bring this teaching, do not receive him into your house or give him any greeting, for whoever greets him takes part in his wicked works" (2 John 10-11). oday Tim Challies has an item about James MacDonald's decision to invite T. D. Jakes to participate at Elephant Room 2. Some of Tim's commenters think it's a fine idea for MacDonald to extend a cordial welcome to someone whose teaching is highly suspect so that he can define and defend himself. Mark Driscoll expressed a similar opinion in his blogpost yesterday. He sees the Jakes invitation as an opportunity for men who differ on fundamental doctrines to "speak to one another face-to-face rather than about one another blog-to-blog and tweet-to-tweet." That all sounds very nice and cordial, and it appeals to values that are highly prized nowadays, but is it a biblical way to respond to heresy? Can you imagine Paul proposing a friendly sharing of the platform with the heretics who were troubling the Galatian churches? How different would the apostle John's advice in his second epistle have been (not to mention his legendary encounter with Cerinthus) if he had embraced the values of our more "enlightened" age? [Commenter at Challies]: "Doesn't basic civil discourse allow people to define themselves"? No. That's pretty much what the postmodern rules of engagement say. But Jesus said, "You will recognize them by their fruits" (Matthew 1:16). In other words, we need to determine whether someone is a heretic or not by examining what [s]he actually teaches, not by what that person claims of himself when [s]he is under fire. Scripture is emphatic about this, reminding us that Satan and his minions commonly disguise themselves as angels of light (2 Corinthians 11:13-15). I don't mind giving the benefit of the doubt to a young pastor fresh out of seminary who might misstate something or need further instruction to eliminate some latent point of ignorance or clear out the cobwebs of confusion (cf. Acts 18:26). But a self-styled "bishop"—notorious for his love of money, who teaches a false prosperity gospel, who freely shills for every aberration on TBN, who was ordained in a Sabellian denomination, who has been confronted repeatedly about his anti-trinitarianism, who refuses to renounce modalism, who declines to embrace any standard expression of Trinitarian conviction, and who (on top of all that) is unclear on practically every doctrine germane to the gospel—such a figure should not be warmly welcomed into evangelical circles and given the platform at an evangelical conference as if we're confident that he is a solid brother with good intentions. Plus, despite your protestations above, both Galatians 1:8-9 and 2 John 7-11 teach us that it's not always the right thing to deal with doctrinal aberrations though "cordial dialogue." Certain theological miscreants need to be avoided rather than listened to (Romans 16:17). Some need to have their mouths stopped (Titus 1:11). Furthermore, true elders and undershepherds of Christ's flock do often have a duty to declare truth through exhortation and rebuke, with all authority (Titus 2:15), rather than acting as if every contrary teaching is an opportunity for friendly dialogue and an open exchange of views. That's especially important in today's spiritual climate, where so many people in the church (including a few once-trusted leaders) ape the worldly conviction that diversity is inherently wonderful and strong convictions are inherently uncharitable. And to whoever asked incredulously whether critics were fearful that Jakes might suddenly lead multitudes astray through the platform given him at the Elephant Room: what concerns me is the fact that he already has, and I think it's appalling that the guardians of evangelical cordiality and "civil discourse" seem utterly unconcerned about it. It isn't "my" day, but I wanted to get two timely tidbits up. My betters, Phil and Frank, should bump when they're ready to fire. The ink is still wet, I know. 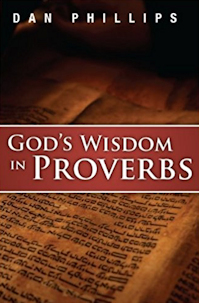 But Kress has been offering God's Wisdom in Proverbs for a whopping 50% off, and that sale is set to expire 10/1/2011. As it is, the same was extended to accommodate folks' pay day. So, if you have any interest in the book, I'd encourage you to save some money, and don't regret it later. In the absence of full reviews, here are some of the gracious endorsers. Other endorsements include Dr. Chris Brauns, Dr. Todd Buck, Eric Redmond, Pastor Steve Meister, Casey Lute, Dr. Michael Rydelnik, Dr. Kevin Zuber, and Adrian Warnock. A number of really terrific posts have been written on this, the latest being Tim Challies. I'm sure others (including my betters here) will weigh in. Here's my thought: would any responsible Christian leader ever say the following? "Nobody is certain what Pastor X believes about whether or not Christ is Lord, but he's an important Christian leader, and we all should listen to him." "Nobody is certain what Pastor X believes about whether or not the Bible is the Word of God, but he's an important Christian leader, and we all should listen to him." "Nobody is certain what Pastor X believes about what a sinner must do to be saved, but he's an important Christian leader, and we all should listen to him." "Nobody is certain what Pastor X believes about whether or not God exists, but he's an important Christian leader, and we all should listen to him." "Nobody is certain what Pastor X believes about whether or not God is holy, but he's an important Christian leader, and we all should listen to him." So does this make sense? "Nobody is certain what T. D. Jakes believes about the Biblical doctrine of the Trinity, but he's an important Christian leader, and we all should listen to him." What I am saying is this: does not the very fact that Jakes is unclear on this basic, fundamental doctrine in and of itself disqualify him as being a man to whom Christian leaders should listen? Isn't clarity on fundamental truths a basic, foundational sine qua non for a Christian leader? This question gets us past the whole swamp of trying to redeem Jakes' conflicting statements on the issue. We don't need to read his mind. If he can't make himself clear on something that a well-taught teenager can affirm, then in what way is he a role model for any Christians to emulate? I realize that I'm assuming something. I am assuming that the doctrine of the Trinity is clearly taught in the Bible. But didn't we decide quite a while ago that this is the case? Are we still supposed to be working out the fundamentals, 2000 years later? Really, I think that should be the main question. Not, "Does T. D. Jakes believe in the Trinity? ", but "Given that people still don't even know whether Jakes affirms the Biblical teaching about the Trinity, how is he in any sense a Christian leader?" 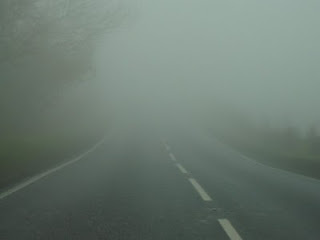 Driving in Scotland was far too exciting, and not always in a good way. As you may know, relative to American (and almost all other) driving, those good folks drive on the wrong side of the road. To deal with this, the driver sits on the wrong side of the car. And it just feels wrong. It felt wrong to poor Jonathan, whose heart stopped a couple of times when my dear wife, sitting on the front left, would lean back and fold her arms. Since that was the side the driver sat on for all of Jonathan's twelve years of life, and since the car was in motion, his first thought was that Valerie would get us all killed. Then he recalled that it was all backwards, I was driving (on the right), and he started breathing again. I ran up or close to the curb (on the left) many times, because Scottish roads are just a hair broader than a single lane is in an average California street. The cars hurtling past (on my right!) seemed like they were all right up in my lap, so I'd list left, brush a curb, Valerie would gasp or cry out, I'd lurch back... and hilarity would ensue. Our constant companion was Clarence. This was the name we gave to our GPS. Clarence was illiterate and had a speech impediment, which was obnoxious because he was worse than Claire, his predecessor, from whom he was supposed to be an upgrade. He couldn't manage the simplest words, let alone the hopeless yet beautiful Gaelic names of some streets. That was the signal that I had taken a wrong turn. So we'd groan, or growl, or both; and wait for the inevitable "Drive 1.4 miles, then turn right." Clarence was infuriating and frustrating, and the company will get a complaint from us about the speech module. But we were glad we had him. Though he'd vex us, he always got us where we were going... eventually. And Valerie (a brilliant strategist and planner) said several times that it was better than if she'd had to be paging through maps over and over, instead of enjoying (most of) the scenery (when she wasn't fearing for her life from the stone wall inches to her left). God is like, and unlike that, I had occasion to reflect. God is a little like Clarence, or vice-versa, in that Clarence usually gets his charges where they need to go, and usually tells them what they need to know, and his route will often seem a bit... complex, or even indirect. But that night when I was driving us back from a music festival, in the dark, at 1-2 in the morning, in the fog, Clarence wasn't confused or lost, and told me right where to go. Further, we tell Clarence where we want to go, and he has no choice but to show us how to get there, best as his programming enables. Clarence never says, "Bad idea, please reconsider." Nor does Clarence simply send us to another location because he knows it is better than our own idea. God, by contrast, is the grand planner. He takes us where He wants us to go. Even our necessary and proper plans and decisions are taken up into His grand plan (Proverbs 16:1, 9). It cannot be otherwise (Proverbs 19:21; 20:24). God never has to say "recalculating," because God has no Plan B. It is all Plan A (Psalm 115:3; Eph. 1:11). 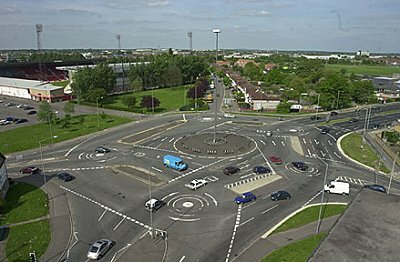 But God's Plan A is indeed very complex, involving many turns and traffic-circles. When Israel spent forty years in that vast, arid traffic-circle, it was still part of the grand plan (Deuteronomy 8:1-5). We were glad to have Clarence helping us make our way through Scotland and England. But we're glad there's no celestial Clarence steering the universe in the same way. First of all, thanks for having me this year, again. I realize that I am one of a handful of odd men out in your stream of videos each year, and I credit Todd Rhoades for setting the trend line there two years in a row by taking a risk on a second-tier blogger who, let’s face it, probably has too much influence already. Props for the opportunity to shine or stink on my own merits – starting with the typos all of us missed in my Bio. Yikes! This year’s topic was, in my opinion, a trick question. Let me put it another way: if it wasn’t intended to be a trick question, it turned out to be a providential opportunity for the people involved either to demonstrate or to disprove something that the critics of your conferences have been saying for years: the conferences sponsored by leadnet.org are not good spiritual food because they are about how to make much of “me”. Now, I say this in spite of, for example, the interesting advice given by Rick Warren in the final video of the conference. (I’ll avoid the purgatory that is discussing Rick Warren on-line, thanks) What was unbelievable to me was the rampant discussion of how much people actually do rely on themselves to do ministry – and the open confessions of how much their churches and organizations depended on them. I had hoped my video would be one in a crowd of videos sort of deconstructing the topic “How I do it.” Instead, it winds up being an open letter by itself to the rest of the conference. Of course, this is why I was pleased to come back this year: because this is how I do it; this is how we do it here at TeamPyro. I offer it as advice for the sake of Christ’s people and Christ’s ministers, and I offer it in good faith and the love of Christ. See you next year, God willing. As you know, I had the great joy of bringing two of the four sessions in the 2011 Ashford Bible Conference, of which the topic was Christ in the Old Testament. Brother/pastors Anthony Forsyth (about whom more, later) and Tom Drion (who serves God in His Word in London) brought the Word in the other two sessions. Pastor Anthony Forsyth invited me and, what's more, hosted my dear wife, two youngest sons and myself. We all absolutely loved the Forsyth family (wife Jenny and children Joseph, Lydia, Phoebe, Timothy and Chloë), and loved our time with them in their stately mansion. Had a terrific time with them, trading accent-teases, as well as meeting first another American house-guest (Jeremy, music-guy), and then an Irish brother (Jonathan, media-guy). Anthony even graciously encouraged my efforts to speak, you know, English. Nonetheless, I felt it wiser to teach and preach in American, with Anthony standing by to translate as necessary. I'd been very anxious in my preparations over the many months since Anthony invited me to speak, poring over reams of volumes and articles on Messianic prophecy, as well as reviewing the Scriptures themselves. How to approach it? How even to touch such a massive, vital topic, over which my betters have labored for millennia with such varying results and degrees of success? You could say this is a subsection of my overall conviction, based on passages such as Hebrews 1:1-2, that the Bible is not a secret codebook. It is a communication, from God, to His people, commencing (always) with the original authors and hearers. These and other passages give me the very strong impression that our Lord believed that the OT, in and of itself, bore witness to Him so directly and overwhelmingly that to reject that witness is to damn oneself. Never does He say anything even approaching, "You know, boys, I can't really blame you for not recognizing Me. Nobody could! The OT is a book of impenetrable mystery. In fact, nobody could fairly be expected to see Me in it. But just you wait: after Pentecost, the Spirit will help My guys read Me into it. Then we'll have a whole different ballgame." Rather, in saying that Moses himself would condemn His rejectors, He is clearly asserting that Moses knowingly wrote of Him. Not wrote-of-something-else-that-later-was-deflected-to-Him, but of Him, Jesus. How to read the Scripture as Jesus read it. How to show that the Scripture in its entirety pointed to Him. How to set this forth intelligibly in two sessions of finite length. How to do all this freshly, persuasively, accessibly, helpfully, and memorably. Whether or not I succeeded, God is judge, and you can judge for yourself. But trying was a joy and an education. In the first talk, I introduce the entire subject of Messiah and of Messianic prophecy, and endeavor to show (in one talk!) how the whole OT points to Jesus Christ. My dear wife says I talked too fast, and I'm sure she's right. My excuse is that I had a truckload to say, and leaned on the fact that folks could (if they wished) listen to the recording or watch the video. That's my story, and I'm sticking to it. In keeping with my conviction, I approached the session not by expounding NT passages with talked about Messianic prophecy, but by going straight to the OT text itself, literally beginning at the beginning. The second talk was really a continuation of the first, and a specific demonstration of ways in which one particular book (Genesis) points to Christ. My third message in Ashford was a Sunday morning sermon focusing on Colossians 3:16 and speaking of the church's vital center. Then in the evening service, I returned to Christ in the OT, particularly speaking (surprise!) of Christ and Proverbs — because Pastor Forsyth had asked me to. An aside: when Anthony and I met at his house, he asked "Have you ever seen this?" — and held up my Proverbs book. I hadn't! It was quite a surprise. Last I heard, the book would not be out in time for the conference. But Anthony had been persistent, publisher Eric Kress had done some magic, and the book had preceded me. That book does contain material and an appendix that relates to Christ in Proverbs, and how to teach and preach Proverbs. However, this sermon takes a somewhat independent approach from the focus of the book. Anthony also had ordered a large quantity of The World-Tilting Gospel, which he handed out to each family in attendance. Say, what a great conference idea. He also sees the book as a ministry-tool, extending Gospel preaching and grounding to all of the families under his care, and I believe he'd commend it to others for the same purposes. Staying with that subject: Anthony is involved in two ministries now, an ongoing ministry Sunday afternoons in Medway, and a new church-plant in Ashford. You can see some more about it here, with more planned in approaching weeks. He would appreciate all of your prayers, and I would commend him to you. England is a land of thrilling history and a dark spiritual present. Any emphatically Gospel-preaching, Bible-teaching ministry will face trials and Satanic opposition, and Anthony's is no exception. Pray for his own walk and ministry, and for his family; and pray for the unity, growth, and evangelistic outreach of his church. There. That should keep you busy and out of trouble for awhile. posted a couple of links in my Twitter feed last week and a vigorous discussion ensued. Because the controversy surrounding the following video clips deals with fundamental matters of ministry philosophy, pastoral propriety, the purity of the church, and the difference between true worship and "strange fire"—and since Twitter's 140-character limit simply isn't enough to let me even begin to say what I think needs to be said about this—I decided to take it up on the blog today. I don't know (nor do I care) if Perry Noble is "lying" in that second clip. He could indeed merely be making the argument that the first clip doesn't actually tell the full story. I wouldn't (and didn't) accuse him of lying. But frankly, whether he lied or not strikes me as the most trivial of all the questions those two video clips raise. Stop and listen to what Perry Noble is saying! If he is indeed telling the truth, the full truth, and nothing but the truth, the admission he makes in that first video is every bit as ugly and outrageous as a lie. Here's a man who is supposed to be a shepherd to the flock of God, arrogantly boasting that he looks for ways to anger and offend Christians who are more conservative than he is. He hits on a particularly offensive idea. In this case, it's a stunt so carnal he doesn't even bother to argue that it has any redeeming spiritual value. Then he and his elders "pray" together to "seek the Lord's direction" about it—and decide to go ahead and do it? Yikes. If that doesn't offend every synapse in your brain, you must be devoid of love for Christ's church. 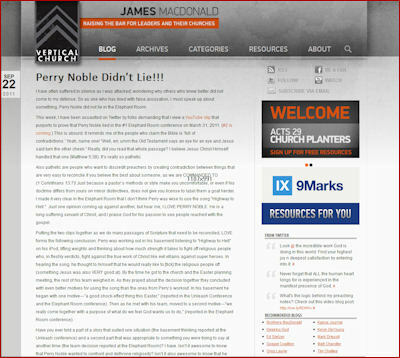 If James MacDonald thinks the big problem with Noble's statement was the "contradiction," and if he is more troubled by the critics' "tone" than he is by Perry Noble's swaggering self-congratulation, then MacDonald is not going to be a very helpful mentor to Perry Noble. I'll say again: the public "mentoring" of bad-boy pastors by men who have earned a degree of respectability is a Really Bad Idea. 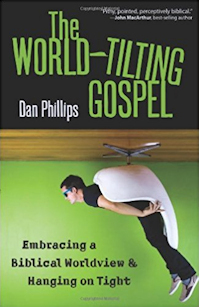 If you're a famous pastor who truly wants to be a help to a young foul-mouthed narcissist rock-star pastor, it would be better to do it privately and withhold your public affirmations of the punk pastor until he gains enough maturity to actually meet the biblical requirements for eldership. Several people on Twitter and Facebook suggested that the "Perry Noble Lied" accusation is the exact equivalent of the agnostic's charge that the New Testament contradicts itself. 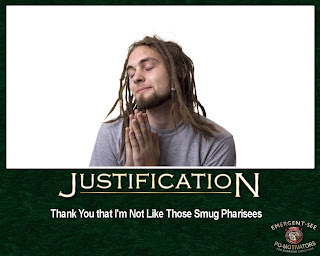 (James McDonald likewise strongly hinted at that argument, likening the two video clips above to "many passages of Scripture that need to be reconciled.") Seriously? Am I the only one who thinks it cheapens the authority of Scripture to suggest that a harmony of Matthew 28:10 and Luke 24:49 is a problem of the same order as the question of whether Perry Noble "sit[s] around trying to [tick] people off" or not? All the word-play and energy that has been put into defending Noble feels like a bad caricature concocted to demonstrate everything that's wrong with postmodernism. Someone who raises no objection when a egomaniacal pastor boasts about looking for ways to offend and irritate other Christians has no moral ground to complain about the "tone" or biases of those who are offended. But the postmodernist spends hours attacking them anyway, exegeting the mischief-loving fellow's braggadocio, making useless arguments about words, in order to defend the honor of the guy who admitted that from the very start his main intention was to offend? What we have here is proof of how pathological the cults of personality among young evangelicals have become. Finally, for those working so hard to reconcile the Perry Noble of the Elephant Room with the self-satisfied scoundrel in the first video above, here's the question you need to ask yourselves: Once we have "reconciled" the statements made in the two clips, what kind of fruit are we left with? 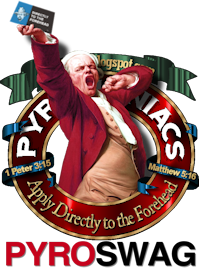 The PyroManiacs devote some space each weekend to highlights from The Spurgeon Archive. The following excerpt is from "Lingerers Hastened," a sermon preached Sunday morning, 12 January 1868, at the Met Tab in London. f you really long to save men's souls, you must tell them a great deal of disagreeable truth. The preaching of the wrath of God has come to be sneered at nowadays, and even good people are half ashamed of it; a maudlin sentimentality about love and goodness has hushed, in a great measure, plain gospel expostulations and warnings. But, my brethren, if we expect souls to be saved, we must declare unflinchingly with all affectionate fidelity, the terrors of the Lord. "Well," said the Scotch lad when he listened to the minister who told his congregation that there was no hell, or at any rate only a temporary punishment, "Well," said he, "I need not come and hear this man any longer, for if it be as he says, it is all right, and religion is of no consequence, and if it be not as he says, then I must not hear him again, because he will deceive me." "Therefore," says the apostle, "Knowing the terrors of the Lord we persuade men." Let not modern squeamishness prevent plain speaking concerning everlasting torment. Are we to be more gentle than the apostles? Shall we be wiser than the inspired preachers of the word? Until we feel our minds overshadowed with the dread thought of the sinner's doom we are not in a fit frame for preaching to the unconverted. We shall never persuade men if we are afraid to speak of the judgment and the condemnation of the unrighteous. None was so infinitely gracious as our Lord Jesus Christ, yet no preacher ever uttered more faithful words of thunder than he did. It was he who spoke of the place "where their worm dieth not and their fire is not quenched." It was he who said, "These shall go away into everlasting punishment." It was he who spake the parable concerning that man in hell who longed for a drop of water to cool his tongue. We mast be as plain as Christ was—as downright in honesty to the souls of men—or we may be called to account for our treachery at the last. If we flatter our fellows into fond dreams as to the littleness of future punishment, they will eternally detest us for so deluding them, and in the world of woe they will invoke perpetual curses upon us for having prophesied smooth things, and having withheld from them the awful truth. When we have affectionately and plainly told the sinner that the wages of his sin will be death, and that woe will come upon him because of his unbelief, we must go farther, and must, in the name of our Lord Jesus, exhort the guilty one to escape from the deserved destruction. Observe, that these angels, though they understood that God had elected Lot to be saved, did not omit a single exhortation or leave the work to itself, as though it were to be done by predestination apart from instrumentality. They said, "Arise, take thy wife and thy two daughters which are here, lest thou be consumed." How impressive is each admonition! What force and eagerness of love gleams in each entreaty! "Escape for thy life; look not behind thee; neither stay thou in all the plain; escape to the mountain, lest thou be consumed." Every word is quick and powerful, decisive and to the point. Souls want much earnest expostulation and affectionate exhortation, to constrain them to escape from their own ruin. Were they wise, the bare information of their danger would be enough, and the prospect of a happy escape would be sufficient; but they, as they are utterly unwise, as you and I know, for we were once such as they are, they must he urged, persuaded, and entreated to look to the Crucified that they may be saved. We should never have come to Christ unless divine constraint had been laid upon us, neither will they; that constraint usually comes by instrumentality; let us seek to be such instruments. If it had not been for earnest voices that spoke to us, and earnest teachers that beckoned us to come to the cross, we had never come. Let us therefore repay the debt we owe to the church of God, and seek as much as lieth in us to do unto others as God in his mercy hath done unto us. I beseech you, my brethren, be active to persuade men with all your powers of reasoning and argument, salting the whole with tears of affection. Do not let any doctrinal notions stand in the way of the freest persuading when you are dealing with the minds of men, for sound doctrine is perfectly reconcilable therewith. I recollect great complaint being made against a sermon of mine, "Compel them to come in," in which I spake with much tenderness for souls. That sermon was said to be Arminian and unsound. Brethren, it is a small matter to be judged of men's judgment, for my Master set his seal on that message; I never preached a sermon by which so many souls were won to God, as our church meetings can testify; and all over the world, where the sermon has been scattered, sinners have been saved through its instrumentality, and, therefore, if it be vile to exhort sinners, I purpose to be viler still. I am as firm a believer in the doctrines of grace as any man living, and a true Calvinist after the order of John Calvin himself; but if it be thought an evil thing to bid the sinner lay hold on eternal life, I will be yet more evil in this respect, and herein imitate may Lord and his apostles, who, though they taught that salvation is of grace, and grace alone, feared not to speak to men as rational beings and responsible agents, and bid them "strive to enter in at the strait gate," and "labor not for the meat which perisheth, but for that meat which endureth unto everlasting life." Beloved friends, cling to the great truth of electing love and divine sovereignity, but let not this bind you in fetters when, in the power of the Holy Ghost, you become fishers of men. From 2009; Brian Thomasson (then of David C. Cooke) suggested that this post might be a good sparking idea for a book. I mulled it over, worked up a much larger vision, and the result was The World-Tilting Gospel, in which Chapter Twelve develops these ideas at greater length. New year — new word! Sarkicophobia. Derivation: In the NT, the term σαρκικός (sarkikos) is commonly translated "fleshly" or "carnal." It is an adjective derived from sarx, "flesh," and means belonging to the flesh, pertaining to the flesh. It occurs in Romans 15:27; 1 Corinthians 3:3 [twice]; 9:11; 2 Corinthians 1:12; 10:4; and 1 Peter 2:11. Sometimes it is used simply of material things (Romans 15:27; 1 Corinthians 9:11), and sometimes of attitudes or thinking that is dominated by the flesh (i.e. unredeemed, un-Christian thinking or attitudes; 1 Corinthians 3:3; 2 Corinthians 1:12). Formation: Unlike nomicophobia, there actually is an existing (if little-used) English word to use: sarkic. The rest is easy. Meaning: I would use this of folks who so fear obeying God "in the power of the flesh" that they'd rather do nothing, than do something carnal. Whatever their theory, their practice can be summed up in this motto: better to disobey God outright, than obey Him in the flesh! Or, Better do nothing for God's glory, than do something fleshly for God's glory! The result is not only paralysis, but a particularly repulsively and repugnantly pious form of paralysis. You dursn't confront these folks for their sin in disobeying God. Do that, and you mark yourself as shallow and — well, carnal! Because clearly, you don't understand: when they disobey God, it's really because they love God so much! It's because they just want Jesus to be all, and God to be all, and themselves to be nothing, like little lead soldiers melted down into the big molten vat of Godness. It's the "thinking" that underlies the ever-popular (and never-Biblical) mantra for daily living: Let Go and Let God. Illustration: reading Andrew Murray and the "higher life" sorts will freeze you up like this. Murray will so terrify you of the thought of acting in the flesh, that you'll collapse into goo. You will want to be a glove on Jesus' hand, moving only when He moves, dissolving into nothing that He may be all in all. Among these folks, it's all clothed with (masked in?) gloriously spiritual and mystical language, and sounds absolutely wonderful. I mean — who wouldn't want that? What Christian wouldn't like to quit striving and struggling and battling and sweating and groaning... and failing? What Christian wouldn't like to be so mastered by Jesus that he lives and breathes and emanates Jesus, so that Jesus lives through Him in the sense of replacing his will and responsibility? Again, this is seen in the phrase: "Stop trying to live the Christian life, and let Jesus live it through you!" Aside: do you see, though, that this only moves the goal, the marker? It doesn't remove it? The idea is that I stop getting my grubby hands all over everything, and let Jesus control everything. Stop trying to do things right — in fact, that's the problem: I keep trying to do things right. And that's wrong. I have to stop trying, and let Jesus do it. Okay, so then... why isn't He? Who's stopping Him? Well, I am. Because I haven't let Him right. I haven't yielded right. I haven't adopted the right resting, yielding attitude. So you see, it's still me, me, me. It's just that we've moved the focus from my obeying right, in faith and by grace (which is an explicitly Biblical focus), to my yielding right (which is not). And I still fail, because I have to strike the right mystical attitude to shift into "J" for Jesus-life. If I'm not there, there's something more for me to do. So even apart from being un-Biblical, it's nonsensical. It collapses on itself. Anecdote: I was infected with this very early in my Christian life. It seemed natural enough to me because of its similarity to the cultic teaching from which I'd been saved. Then we believed that God was all and in all, and we just needed to "manifest" the God-life. This teaching is very similar, only it focuses more on Jesus rather than the mysticized redefinitions of Religious Science. So, like J. I. Packer and many Americans as well, I tried and tried. That is, I tried not to try. I tried to melt... er, that is, to let myself be melted. (But wait, if I'm doing the not-doing... if it takes me to not take me to... whoa, like I said, this gets really confusing....) And, like J. I. Packer, it made me pretty miserable. But my circle of Christian friends was also infected, and we all had the same fear: acting "in the flesh." We were afraid of going to church in the flesh, witnessing of Christ in the flesh, praying in the flesh, studying the Word in the flesh, obeying the Word in the flesh. So, for fear of doing any of those things in the flesh, we'd stop doing them altogether. Some of us could be pretty smug about it, too, and could look down on others who were very energetically involved in church, witnessing, and holy living — but we were pretty sure that it was, you know, in the flesh. It came to a head for me in my first course of pastoral training. It's quite a long story in itself, but the bottom line is that I'd gone from being a lazy, undisciplined student before my conversion, to being very committed to immersing myself in Greek so as to master the New Testament. But many of my fellow-students wouldn't. They wouldn't study too hard, get into it too deeply. Why? Whyever not? You've already guessed: all that studying was in the flesh. The effect of sarkicophobia on me was that I was ever taking my spiritual pulse, ever checking within, freezing up, paralyzed, spiraling down into deeper and deeper morbid introspection. In the name of "looking to Jesus" (revealed in His Word) I was constantly looking to myself, within myself. And so what should I do? Should I leave off the hard, sweaty, grueling work of study and "let God," for fear of studying in the flesh? In short: God set me free. Somewhere around that time I began to realize how comparatively simple, straightforward, and in-broad-daylight New Testament Christianity was. Never ever did you see an apostle or Christian on the side of the road, locked in a whirlpool of introspection over serving God by Spirit-enabled, faith-motivated, grace-empowered obedience to Gospel commands in the flesh. Nor did we ever read of an apostle issuing a series of commands in Christ's name, then immediately cautioning his readers against obeying them in the flesh. Nor was the concept of flesh introduced by Paul to make Christian living more complicated. True, he depicted the fact that the flesh complicates Christian living (Romans 7:14-25); but he never compounds the issue by horror-stories of grace-saved, born-again, Spirit-baptized Christians living for God's glory in the flesh — as if it were some sort of indefinable mystical state of being, more powerful than the Holy Spirit and the new nature. True, the apostles warned against pride, arrogance, lust, covetousness, divisiveness, bitterness and such things; and, true, these are works of the flesh (Galatians 5:19-21). But Paul says those works are "obvious, apparent, plainly evident" (Galatians 5:19). Never would Paul have interrupted an aglow, on-fire, Christ-loving Christian from telling the Gospel, and told him to go to his closet and stop witnessing until he was sure he wasn't doing it in the flesh. And so I decided — about Greek and a great many other things. I'd give it everything God gave me to give, out of love for Christ, and to be of use to His church. And if it made me arrogant, I'd take the arrogance to the Cross, and deal with it. And get on with keeping His commands. Because that's what love for God is (1 John 5:3), and that's what people who love Jesus do (John 15:14).. I wasn't going to use sarkicophobia as an excuse to avoid all-out living for God's glory, through grace, by the Spirit's power, in obedience to the commands of God. In sum: sarkicophobia creates people locked in perpetual self-absorption in the name of Christ, ever taking their spiritual pulse, immune to direct appeals from Scripture to believing obedience. The last thing it produces is Christ-centered, God-glorifying, robust, hearty, daring, fruitful, pioneering, world-rejecting Devil-defying Christians. There are no decent videos of Guy Smiley from the Muppet Show on the internet, otherwise this video response would have been extremely brutal. iMovie 7 is not iMovie HD. Sheesh -- what a massive step backwards. If you attempt to install iMovie HD on your MacBook Pro, it won't run if iMovie 7 is installed -- but the installer will delete GarageBand for you and you better know where your install disk for iLife '08 is or pay the price. $14.99 to be exact. Syncing video to audio in iMovie 7 is like trying to jump on a rolling skateboard while wearing roller skates and carrying an egg in a teaspoon. Wear a helmet. Spell check titling before you render the video, otherwise you wind up with the word "RELEVENT" (sic) vexing you mightily. Ugh. There are a LOT of plug-ins for iTunes Visualizer, but only some of them actually deliver performance-quality video. You are best served not to pay for any of them. If you only need 180 seconds of video captured, anyone can do that. If you need 5 minutes of video captured, you will likely have to spend some money. If you think you can, in mid production, scrap your original idea and then produce a 5-minuted animated short using the soundtrack you already have, you must be drunk. (even if you are dry as a rock) I don't care if you already own the software: you can't do it. (unrelated to this video) I am a sucker for woot.com. Labels: apologetics, centuri0n, discernment, doctrine, open letters, pastoral ministry, Steven Furtick, What is Love? You know what? I ran out of daylight AND moonlight this week, and the video response will be worth it. It may not be the top-10 post I sort of promised, but it's worth the wait -- worth letting me have an extra night to get it in the can. But as a warm-up for that post (to be tomorrow, and DJP's post will roll over into Friday), I have an oldie but a goodie along the same lines. Enjoy. Anyway, since Phil re-reviewed the "Why We're Not Emergent" book, I thought I'd coat-tail him again and sort of pre-emptively review the other book he raved about in that post. But as I was reading it, I had this problem I had to resolve: I found another book which I thought needed a review in a much more urgent way. That "more urgent" book is a little tome called Pop Goes the Church (hereafter PGTC) by a fellow named Tim Stevens, and I came across it in my own bookstore. See: we belong to this marketing group which helps us out by publishing very slick advertising materials and mailing them to our customer lists, which is of course a perfect thing -- except that it causes us, from time to time, to bring in books we wouldn't otherwise, um, proffer. The reason is simple: these books get the ad money from publishers, and that money ultimately pays for the catalog. Yes, I get it: that's ugly. That is also the way it goes when you join a marketing group: you have to somehow get past the 20% junk and somehow capitalize on the 80% better-than-junk to try to get people to come back into the store. Anyway, I grabbed the copy of PTCG and started reading it so I could review it, and the strangest thing happened to me: I realized that the other book was actually reviewing this particular book for me. If I were a charismatic, I think I would attribute this to the Holy Spirit speaking directly to me through these two books. But of course, I have to maintain the semblance of dignity here, so let's just say that God, in His providence, gave me the fodder for a brilliant blog post today, and you're merely fortunate enough to get to read it. 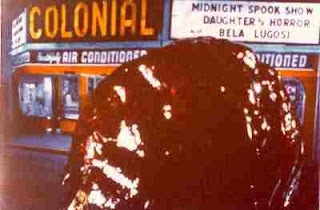 See: here's the thing. Over the last couple of weeks there has been a little dust-up in the blogosphere as to whether one should recommend that others not read a book one finds offensive. One blogger in particular tried to make his point very transparent by deleting posts at his blog which disagreed with him about his point of view -- which, I think, is not exactly the message he was trying to send, but we all have an idiom which we tend to drop into. Anyway, rather than make the obvious "don't read this book" post about Tim Stevens' book, let me suggest something else instead: first read David Wells' book The Courage to be Protestant and then read Tim Stevens' book. Because it seems to me that the only way to really "get" either one of these books is to actually put them side by side and, frankly, let the best man win. Seriously: read them both and compare them. Or read them both and then give them to your pastor. Just don't freak out when he realizes that one of these books is a cook book, and he likes that one better. It'll be perfectly creepy like that Twilight Zone episode "To Serve man", because that's exactly what one of these books is advocating: to serve man. There is an awesome update to this post, BTW: Tim Stevens now wants to remove the word "saved" from the Christian vocabulary when we are speaking to lost people. That is so amazing its making my eyes hurt. Maybe my eyes hurt from forcing iMovie to place text where I really, really want it. From June, 2006; still timely, unfortunately. 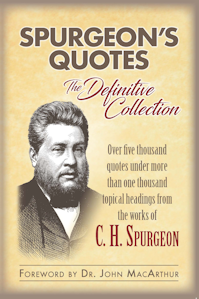 The PyroManiacs devote some space each weekend to highlights from The Spurgeon Archive. The following excerpt is from "Earthquake but not Heartquake," a sermon originally preached Sunday morning 27 February 1887, at the Met Tab in London. am often sadly tossed about because of the heresies and false doctrines of this present age. It grieves me to the heart to see the want of spirituality among ministers, and of holiness among professing Christians. It cuts me to the quick to see the utter rubbish and poison which is preached instead of Christianity. At times it looks as if all things were going wrong; the men to whom one looked as pillars, forsake the faith, and the staunchest give way for the sake of peace. We are apt to cry, "What will become of us?" But if God is our refuge and strength, we need not be afraid, even amid general apostasy. While God lives, truth is in the ascendant. I remember years ago meeting with that blessed servant of God, the late Earl of Shaftesbury. He was at Mentone with a dying daughter, and he happened that day to be very much downcast, as, indeed, I have frequently seen him, and as, I am sorry to confess, he has also frequently seen me. That day he was particularly cast down about the general state of society. He thought that the powers of darkness in this country were having it all their own way, and that, before long, the worst elements of society would gain power, and trample out all virtue. Looking up into his face, I said to him, "And is God dead? Do you believe that while God lives the devil will conquer him?" He smiled, and we walked along by the Mediterranean communing together in a far more hopeful tone. The Lord liveth, and blessed be my rock. All long as the Lord liveth our hope lives also. Gospel truth will yet prevail, we shall live to see the old faith to the front again. The church, like Noah's dove, will come back to her rest again. orm Sper went to heaven Wednesday night. You may never have heard of Norm before, but you probably owe him more than you realize. I certainly owe him more than I could ever repay. Norm lived an amazing life. Born in Hollywood, CA in 1925, he was surrounded by sports and show business. Norm's father, Norman L. Sper, Sr., was a celebrated WWI war correspondent and hero who later starred in and produced "Football this Week," one of the earliest successful syndicated sports television programs. Norm's mother, Winona Winter, was a well-known vaudevillian and early film actress. Will Rogers was Norm's godfather. Norm showed outstanding athletic and academic promise very early, and he left home as a teenager to attend prep school in Andover, Massachusetts. After high school he received an appointment to the Naval Academy at Annapolis but chose instead to attend the University of North Carolina at Chapel Hill, where he led the UNC swimming and diving team, setting NCAA records with his diving and backstroke performances. 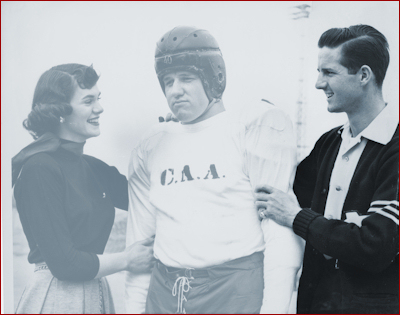 Norm was a four-time first-team All-American (1947-1950), the first in UNC history. He was chosen for the United States' Olympic diving team, but because of World War II the 1940 and 1944 Olympics were canceled, so Norm never swam or dived as an Olympian, though he was arguably the best diver in the world through most of the 1940s. During those years at UNC, Norm repeatedly was elected as head cheerleader. The position perfectly suited his upbeat and always optimistic personality. He is remembered to this day in Chapel Hill as one of UNC's most popular cheerleaders ever. 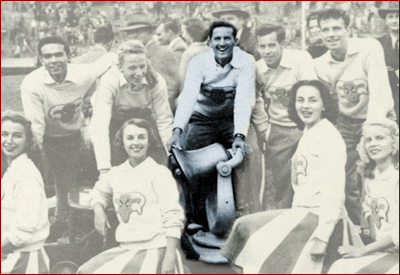 In fact, Norm's longest-lasting contribution at UNC was the Victory Bell—the famous trophy that goes annually to the victor in the UNC-Duke football rivalry. Norm got the bell from an old steam train. His counterpart at Duke, cheerleader Loring Jones, mounted it on a cart. The bell is one of the oldest, most famous rivalry-trophies in college football. With his Hollywood roots and world-class swimming expertise, Norm naturally made friends of people like Johnny Weissmuller and Esther Williams. He once showed me (reluctantly, and at some else's behest) a photograph of the three of them laughing together at a party. 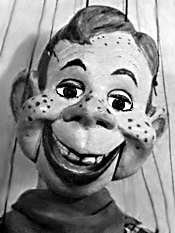 Norm never boasted about his athletic achievements. I never heard him talk about the glory of his college athletic triumphs. If anyone ever brought up the subject, he blushed and downplayed it. After college, Norm emerged as a gifted entrepreneur, both creative and successful in practically everything he ever did. 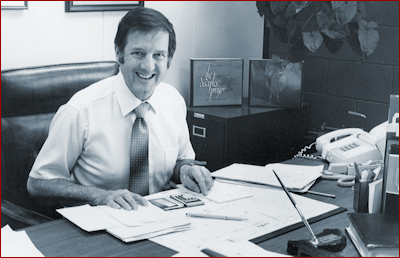 He became an Amway distributor in the formative years of that company and his Amway business quickly grew sufficiently that he was able to retire early. Then Norm started a business called "On-the-Spot Duplicators." He would record convention speeches, making cassette copies on the spot and selling them to attendees within minutes after the end of each session. 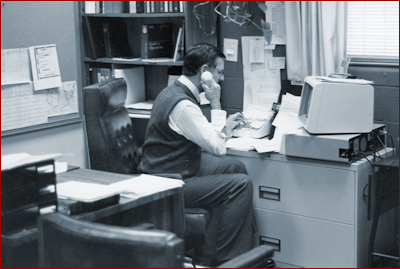 Once that business became prosperous, Norm sold it and entered the second phase of his "retirement." All those were fine achievements and certainly would have been more than enough for the typical person to feel an inflated sense of accomplishment. But Norm's greatest, most far-reaching contribution came after that second retirement. Norm was the founder of the "Grace to You" radio program. Norm Sper came to me one time and said, "We ought to be on the radio." And I said, "Well, that's great. Why don't you do that? Why don't you pray about that and pursue that ministry if God has brought you to that?" The truth is, John MacArthur at first had very low expectations and a low level of enthusiasm for the project. Norm had no prior experience in radio. No one who actually worked in Christian radio seemed excited about the idea. Virtually everyone in radio whom Norm had talked to had tried to discourage him. From a rational and business perspective, the whole idea seemed impossibly fraught with negatives. Plus, John MacArthur made it clear from the outset that he had no time to sit in a studio and record a half-hour broadcast each day. No problem, Norm said. He intended to air the sermons anyway. He would edit them into half-hour segments to make the broadcasts feasible. That was the chief element of the plan that practically everyone with any expertise in the industry said was unworkable. They insisted the only way to be successful with a daily Bible-teaching program was to speak directly to the radio audience from a studio, the way J. Vernon McGee did it. Airing a sermon wouldn't do. Half a sermon was an infinitely worse idea, they said. But Norm persisted. 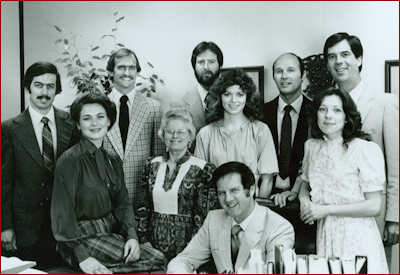 After a couple of short-lived attempts at buying time on secular stations (adjacent to a horse-racing broadcast, in one case) the first regular daily broadcasts of Grace to You in its current format began in 1978—launching simultaneously in Tampa, Tulsa, and Baltimore. 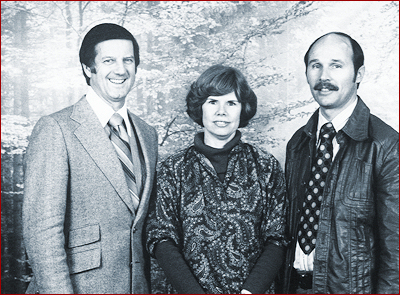 By the time I came to work at Grace to You in 1983, the ministry's foundation was already solid and the ministry was growing steadily. Norm retired again sometime around 1989 or '90, finally for the last time. Declining health in the past decade seemed to heap difficulty upon difficulty for Norm and his family, and though we will miss him terribly, we rejoice that he has entered the presence of Christ, whom he loved and served so faithfully. Norm Sper was one of the gentlest, humblest souls I have ever met. My entire career and life's work were made possible by him. I'm grateful every day for his faithfulness. I can't wait to be reunited with him in heaven. "Blessed are the dead who die in the Lord . 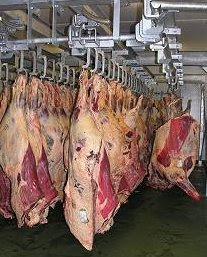 . . that they may rest from their labors, for their deeds follow them!" (Revelation 14:13).